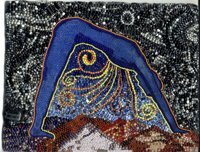 In the spring of 2002 I began thinking about the possibilities for a piece of seed bead art depicting the Egyptian Sky Goddess, Nut (pronounced Noot). I felt this was a good subject for seed bead art because I could use the variation in color and finish of the beads to make the night sky mysterious, wonderful, and a little sparkly. I began looking at mythology and archaeology sources for ancient images of Nut. The best of them showed her with stars in her body, which I liked, but the body shape was awkward and unattractive, apparently designed to fill the edges of the space on which it was painted, so she came out pretty rectangular. As I thought about how I wanted to present her, I began thinking of yoga poses, which led me to yoga books, and then to create this colored pencil sketch. I started planning the types of seed beads I wanted to use for each section, and ordered beads to supplement my stash. I etched the surfaces of some beads to get more matte-finish opaque beads for the land portion of the picture. I pulled bags and tubes of beads from my bead stash. I filled a gallon size Ziploc bag for each of the four areas of the picture: Goddess, Sky, Earth, and Chaos. Not all of the beads would make it into the finished product, but they were all likely candidates. I began the beading by carefully shaping the goddess in transparent blue seed beads. I wanted the transparency to express the other-worldly character of her, while opaque yellow and gold borders clearly defined her. Getting just the shape I wanted, using freeform brick stitch, required constantly checking the beadwork against the sketch, a certain amount of grumbling, occasional swearing, and frequent tearing-out of portions that were veering off-course. Below you can see the finished goddess lying atop the sketch. Seed bead artwork is about precision. That's why I do most of my beading under a magnifying lamp, so I can really get each little seed bead aligned just the way I want it. I search through my beads for one that is just the right size, shape and color to either keep a clear line, or break up a line into a more random-looking pattern, depending on where I am in the piece. This piece I thought of as four separate areas, each to get its own treatment: The goddess is transparent, shaded simply, and outlined definitively. The earth is mostly matte, mostly opaque, and mostly larger beads, all to emphasize solidity. The colors are muted because it is night. The sky has many opaque seed beads, lots of contrast between stars and streams of starlight and the background sky. The sky is darkest at the top and blends down to lighter blues. In the stories about Nut, it is said that the stars streamed from her breasts, so I have begun the streaming lines there. The surrounding grey area I think of as Chaos, with Nut defining and encircling the sky that humans perceive. Originally I thought this area should be transparent and very plain, but after trying a section that way, I wasn't pleased with the effect, so I changed to a grayscale sort of palette and patterns that bear similarity to those in the enclosed night sky but that seem less organized. I signed the seed bead art by signing a flat two-holed stone bead. I used a teensy brush and the kind of enamel that model railroaders use, then coated the signed bead with varnish. At the top of the page is the finished beadwork before being (tediously) stitched to a velcro backing for mounting in a frame. Finished size of the beadwork is approximately 10" by 7.5". You can see the bead with the signature to the left of Nut's ankle. The project was finished in March, 2003, and took about 200 hours of work.